Moisturize! Moisturize! While every cheap North America motel provides hand lotion and conditioner, even the better Swiss hotels may not. Bring your own or buy some in Switzerland. Conquer the duvet. Your Swiss bed will come with a duvet. Though loved by Europeans, I loathe it. It’s always too hot, and you can't peel off layers in the night. Swiss sleepers solve this by opening a window, throwing out a leg (out from under the duvet, not out the window) and, if they're still too warm, getting out from under and snuggling up to it. Maybe you'll succeed where I've failed. Learn what “on time” really means. You think it means within five minutes of the specified hour. In Switzerland, it means you missed your train. Or bus or ferry or paddle wheeler or tram or the plane home. These are the people who invented the wristwatch. Punctuality is a prime virtue, well ahead of purity of mind and spirit (see 5. below). When they say the train leaves at 9:02, don’t show up at 9:03. Get fit before you leave home. Compared to the ever-expanding North Americans and despite all that cheese and chocolate, Swiss are rail thin. Why? They walk everywhere, including up long flights of stairs. On my last trip, two 76-year-olds — one a female art collector in Lucerne; the other a male tour guide in Bern — beat me up flight after flight. And I'd been skiing all winter. Expect to be puzzled. On Swiss television, 10 p.m., Channel 33, stands a woman with a mike in hand. She has an intensely thoughtful look, a furrowed brow, and she's writing feverishly on a blackboard. The woman is wearing a miniskirt. And nothing else. The next morn, my Swiss friend Michelle explained it to me, but I’ll leave that surprise as a way for you to make Swiss friends of your own. Behind the Green Tag. The worst thing about an overseas vacation is hauling your stuff from airport to plane to train to whatever. If you fly Swiss International Air Lines, a.k.a. SWISS, you can kiss that nightmare goodbye. Leave the bags at your first airport, and you never touch them — or even see them — again until they magically turn up in your Swiss hotel room. The Swiss Travel System strikes again. Eat your veggies. At least on the German side, restaurants are strong on meat but weak on vegetables. All they serve are carrots, cauli and peas, each of them on the verge of overcooked. (If you see “Risi Pisi” on the menu, it’s just rice and peas.) But, these same restaurants have excellent salad bars, so you can still get your daily dose of roughage and antioxidants and Vitamin Whatever. Drink like the Swiss. Quick, what’s the Swiss national drink? Hot chocolate? Nein. Fine wine? Non. The Swiss national drink is Ovomaltine, a malted powder you mix with milk. Sound familiar? Yep, it’s the same drink as Ovaltine. Skol! Buff up. 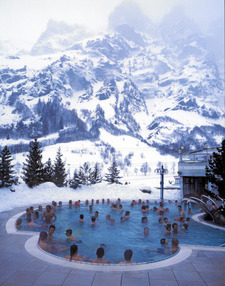 In spa towns like Leukerbad, the public baths are swimsuit-friendly. The private baths, saunas (pronounced sound-a with a silent d) and steam rooms are not. Unless you enjoy being told to “Get out of that clothing or go home!” by a very determined attendant in front of a lot of naked Europeans, my advice is to go buff. Langiappe. Switzerland is a land of pure water. You can swim in the lakes and drink from the tap. So, to save money — and help save the planet — in restaurants, always ask for “Brunnenwasser” on the German side, and “eau de robinet” on the French. Jules Older is a prize-winning writer. His latest adult book is Backroad and Offroad Biking. His latest for kids is PIG.